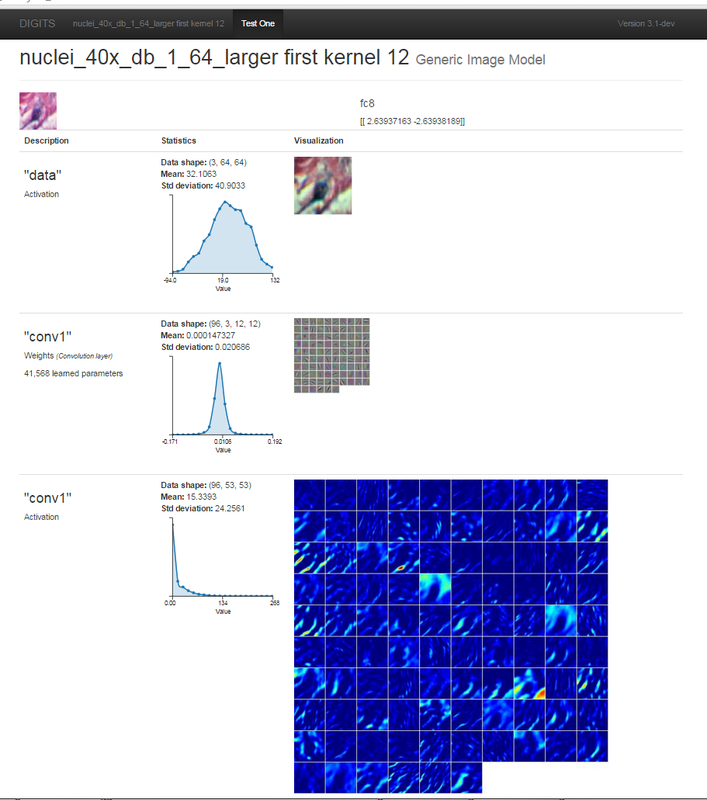 Ultimately, it is a nice user interface for training and examining deep learning models. I have only been using it for a few days, but its something that I myself would have developed if I had an infinite amount of time. They seem to be offering all of the functionality that I have in a hodgepodge collection of scripts in a nice stable UI. I can easily say, as well, that its greatly improved my organization being able to review old convergence graphs and models. There are two components to install. Digits is simply a UI that sits on top of Caffe. The version of Caffe that is required isn’t the one commonly available in the BVLC repo, but a Nvidia fork that we’ll call “caffe-nv”. Its dependencies, compilation, and installation are similar to that of Caffe, so we won’t go into full detail on that (though if you need additional assistance, I’ve written a blog post about that here ). At the time of this writing (December, 22nd 2015), the current version of caffe-nv is compiled against a cudnn v4, which has not been released publically as of yet [see https://github.com/NVIDIA/caffe/issues/85]. As a result, 0.14.0-rc.1 will compile, but 0.14.0-rc.1+ won’t. Remember one needs to run the activate command every time the virtual environment is to be used. which resulted in a complete set of wheel in the opt directory. We’ll use the production environment version which has better speed and is more stable. It will ask for the location of the caffe-nv which we can provide (/opt/caffe-nv) and it should be off to the races. which may be important if you want to point it at a different instance of caffe or to change the dataset/job directories (i.e., you have a large storage volume mounted somewhere else). Then to access it, simply go to the computer’s ip address with the associated port and voila! Keep in mind, that each user will have their own instance, which is running on a unique port. This article doesn’t discuss how to setup authentication, so anyone can submit jobs. If your setup is behind a VPN (as ours is), this isn’t so terrible, but users need to be aware that they’re accessing the correct instance! The only slightly annoying issue is that Digits requires LMDBs instead of leveldbs. They said that they dropped leveldb support since it isn’t supported cross platform. This in itself is fine, except that all of the database I currently have are in leveldb format, so if I want to use them in the future i need to remake them using LMDB. In case anyone is interested, I opt for leveldbs since the file sizes appear to be significantly smaller in my (and other) use case. 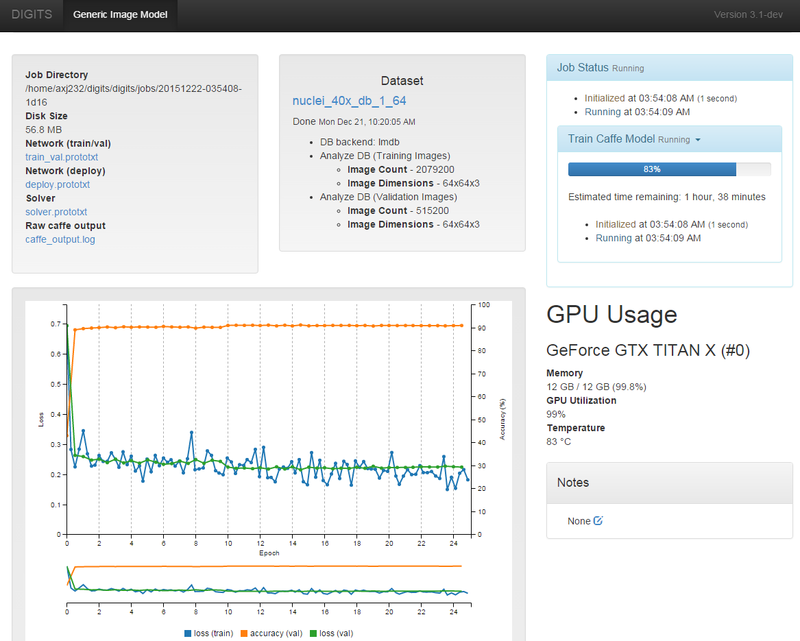 Other than that, Nvidia Digits seems to be providing some very nice functionality, taking me away from writing scripts on the command line and instead having a beautiful UI to work with. Very excited for the new year and a chance to delve deeper into it! I am facing problem to install nvidia digits. kindly suggest me how can i create environment for that.